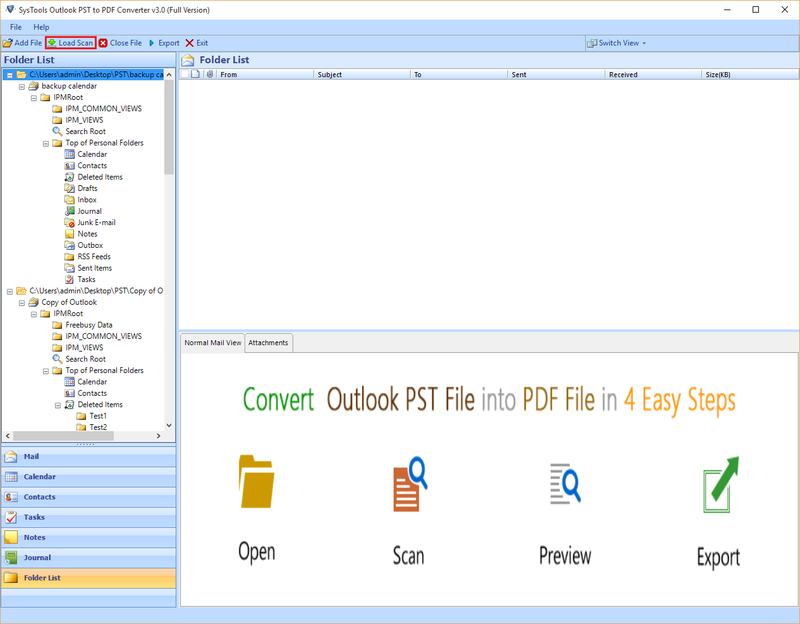 Users can create PDF document for every data item present in Outlook PST files. Using the utility, users can save Outlook emails to PDF, Outlook contacts to PDF, to-do lists, calendars, journals, notes etc can also be converted to PDF. The software converts all attachments and embeds them to PDF. 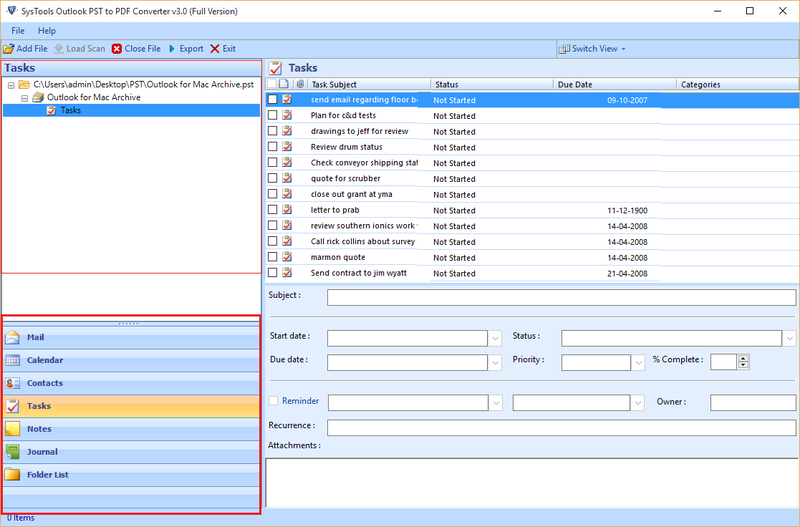 In case of transferring the selective items, users can even perform the batch conversion too. Click on the Export option, it enables a pop-up window. From where, users can easily check/uncheck the folders that are needed to be converted or not. 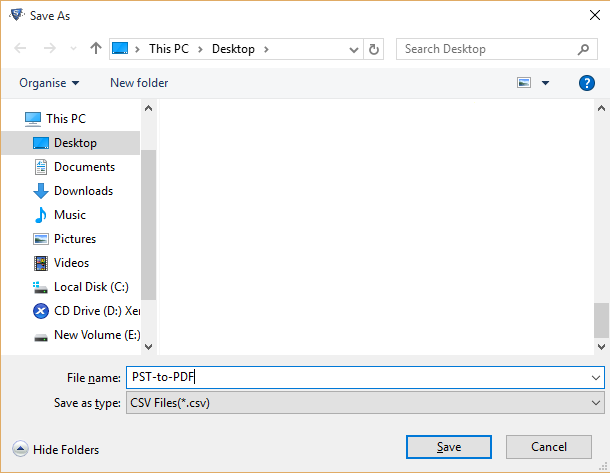 Using this, conversion of selected folders from PST to PDF can be done. 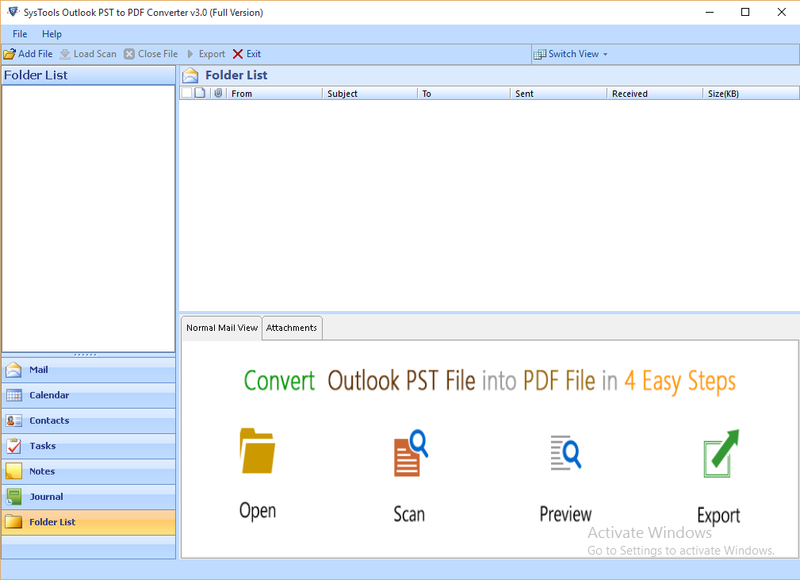 The Outlook PST to PDF Converter tool provides users with an instant display of all items like Outlook mails to PDF, address books, calendars, to-do lists, notes etc. It renders users with all Associated attributes like To, Cc, Bcc, Sent, Received date, Name of Contacts, Mail Addresses, Contact Numbers, Scheduled Calendars, Meeting Alerts, etc are also available in Readable form. 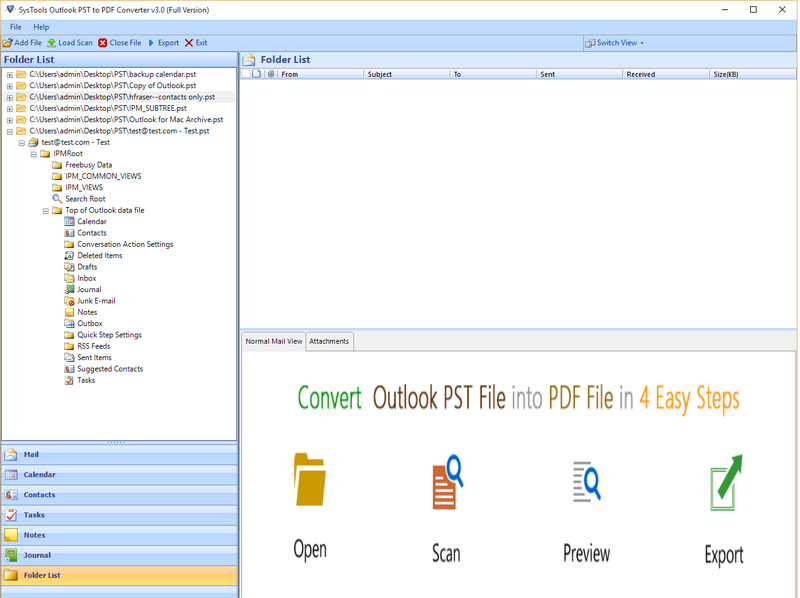 Once scanned and previewed the Outlook PST files contents, users can export PST file to PDF that too selective items. The selective items comprises of mails, address books, tasks, calendars, notes, journals etc. 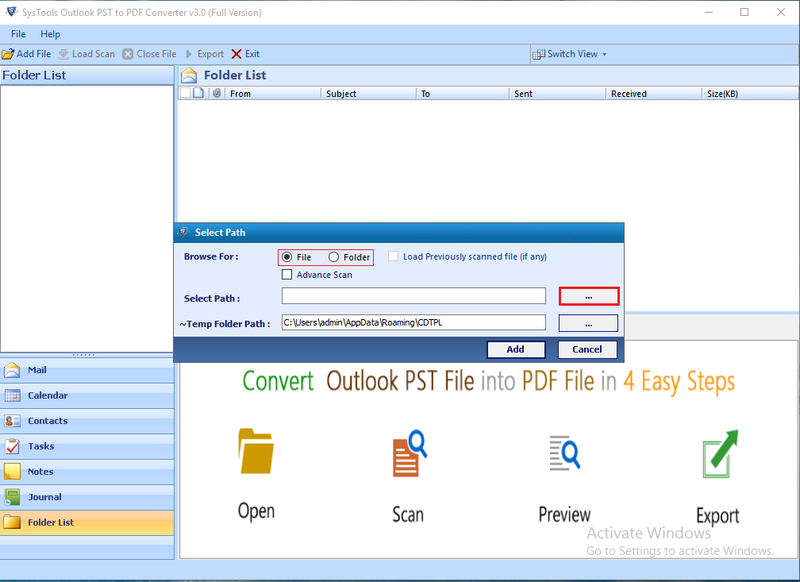 Users can opt to convert Outlook mails to PDF and Export Outlook Contacts to PDF. Users need to just select the items that are needed to be exported as PDF. Right click the option and it opens an export window and provides an interface to continue the process of conversion. 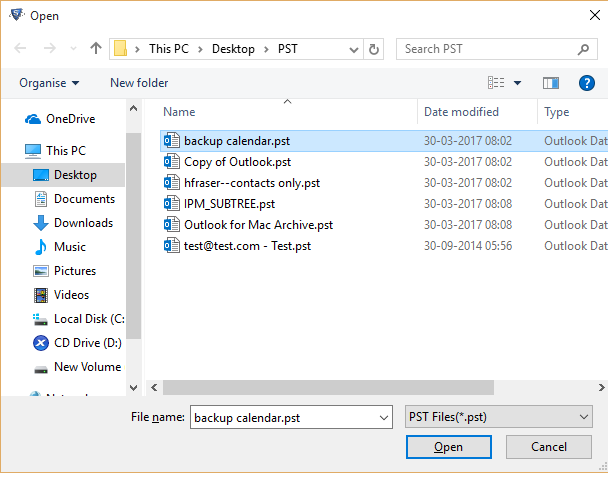 While navigating the PST files, software provides users with select Folder Mode to add Multiple Outlook PST files. This provides users to perform batch conversion of PST to PDF document with an ease. In addition to it, the tool even provides saving the items of PST as PDF. Using this option, you can even provide any name to the files. Users can even choose the file name of any choice like DD-MM-YYYY, MM-DD-YYYY. In spite of it, provides save as subject, auto increment etc. While beginning the entire process, PST to PDF converter tool renders users with two alternatives for converting PST to PDF. 1. 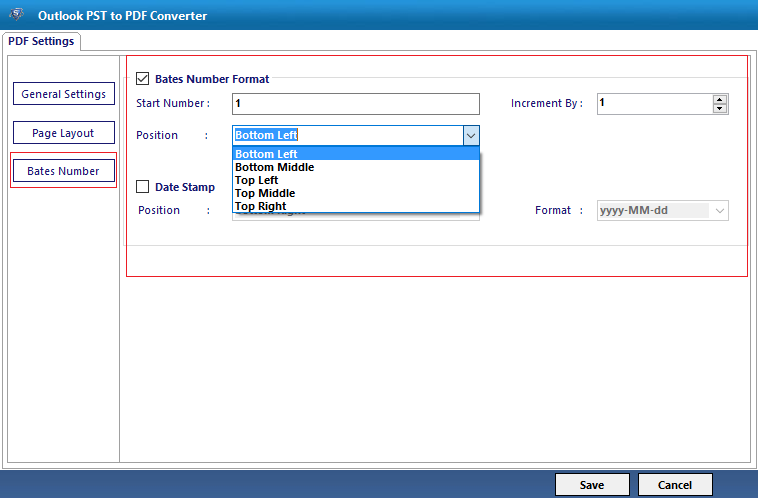 File Mode: It can easily convert single PST file to PDF. 2. 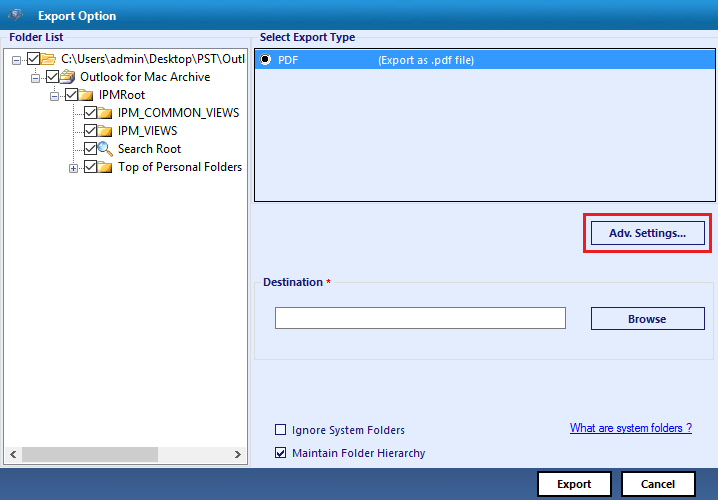 Folder Mode: via this option it is possible to export multiple PST file to PDF. In addition to it, it provides users with Date Stamping and Bates Numbering Mode. It allows users with Advance Settings and specifies bates number in PDF according to position and provides Date Stamping Feature. 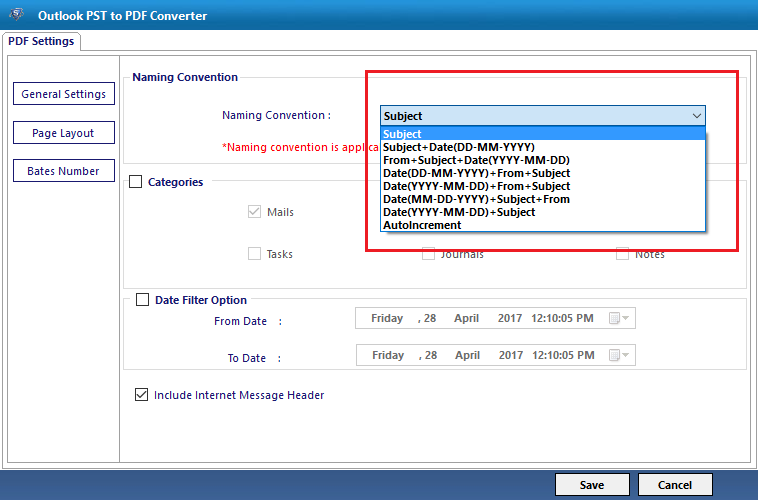 The PST to PDF converter tool provides users with an option to maintain the Folder hierarchy of converted Outlook PST Files to PDF. In addition to it, the tool even renders users with a date filter option. 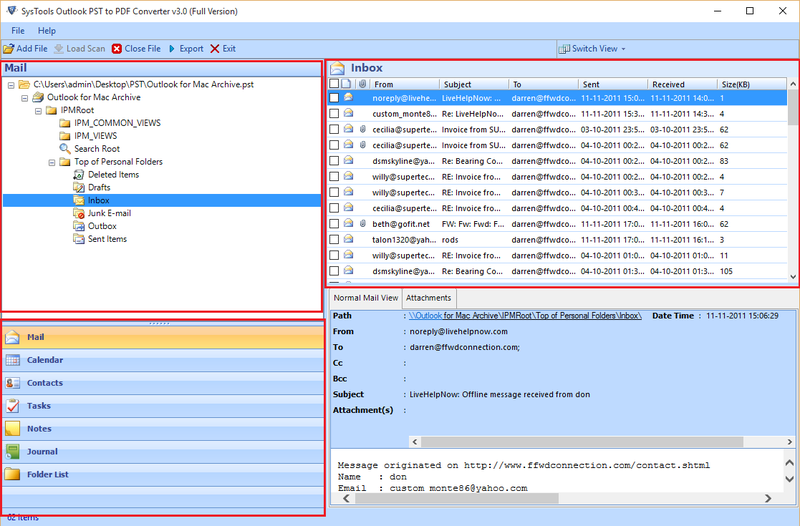 Using this option, users can easily filter the emails stored in Outlook PST files to a particular file. 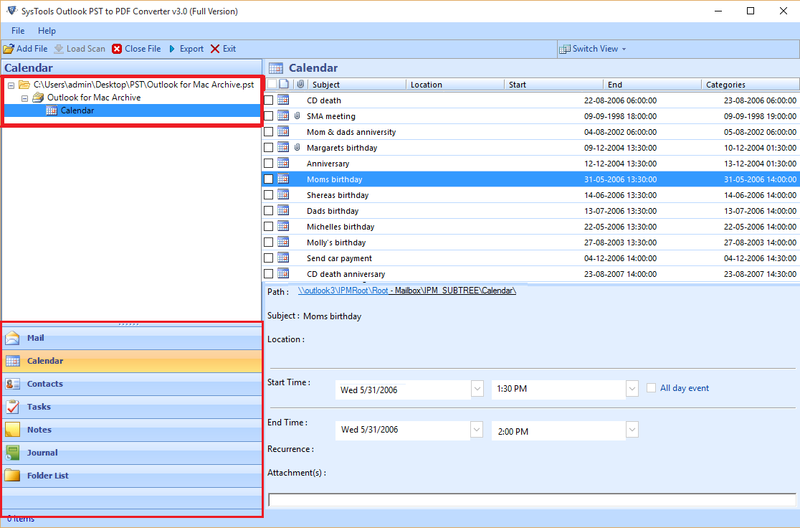 It even generates users with an option to sort all mails according to the filtered date. The software provides users with an option to save the output file to a particular location. In case, users want to create a new folder from the panel they can make it and save the files to it. It even provides the users with an alternative to convert Outlook PST file to PDF and offers users to set Page Layout and orientations. It offers the users with a Paper layout specification for paper orientation in Portrait, Landscape mode and Page Size limit as A4, A3 Letter. 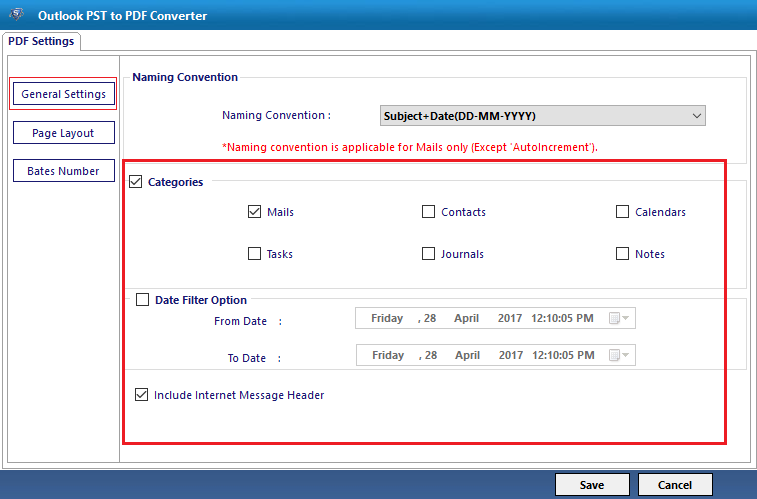 Is it possible to Export Outlook 2010 contacts, mails to PDF using the PST to PDF Converter Software? 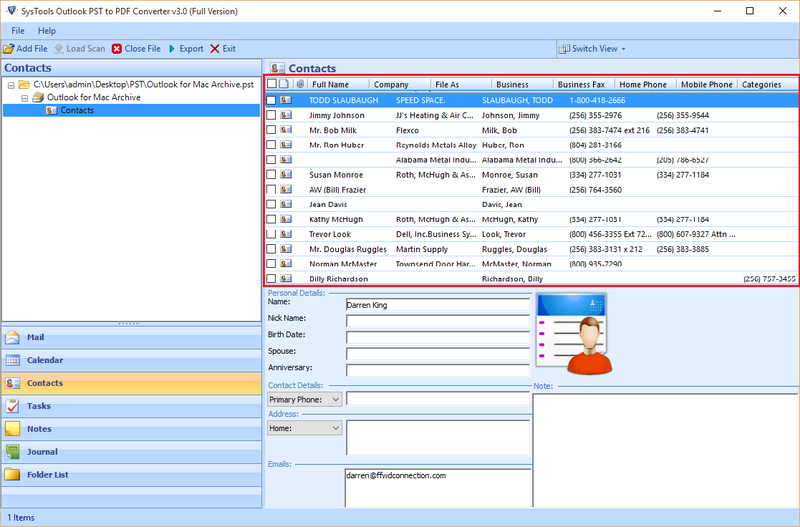 Yes, the tool is able to convert Outlook contacts, mails to PDF with no issues. Instead of it, the program even provides the users with option to save the files at desired location and flexible naming conventions. Is it possible to convert PST files to PDF with Attachments using the converter tool? Yes, the tool provides the option of convert PST files along with attachments. Using this alternative, users can easily perform the conversion of files and its associated attachments. 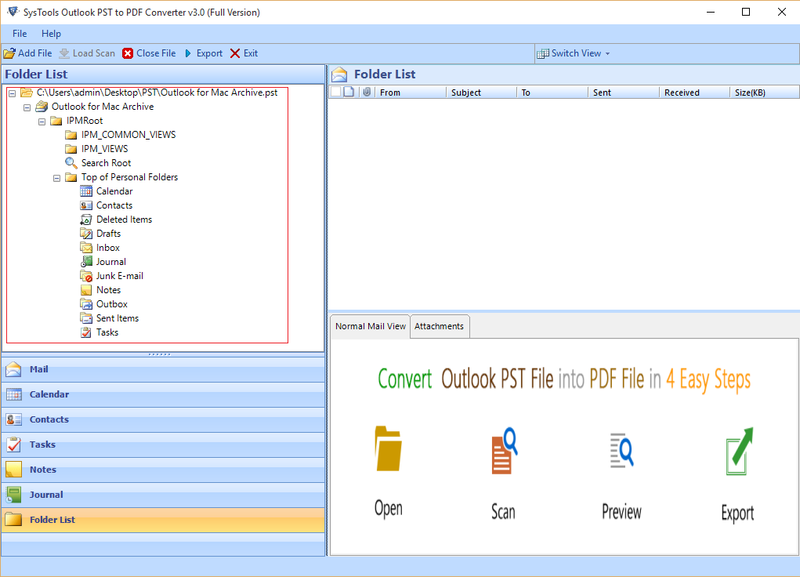 Is the Outlook to PDF converter Wizard able to cover up Corrupted PST files to PDF too? Yes, the tool provides users with two recovery modes i.e., Quick Scan as well as Advance Scan option. Using this option, users can easily recover the files and save them to a desired location. Is the software capable to preview Outlook Emails with attachments? Moreover, is it compatible with all Windows Operating Systems? 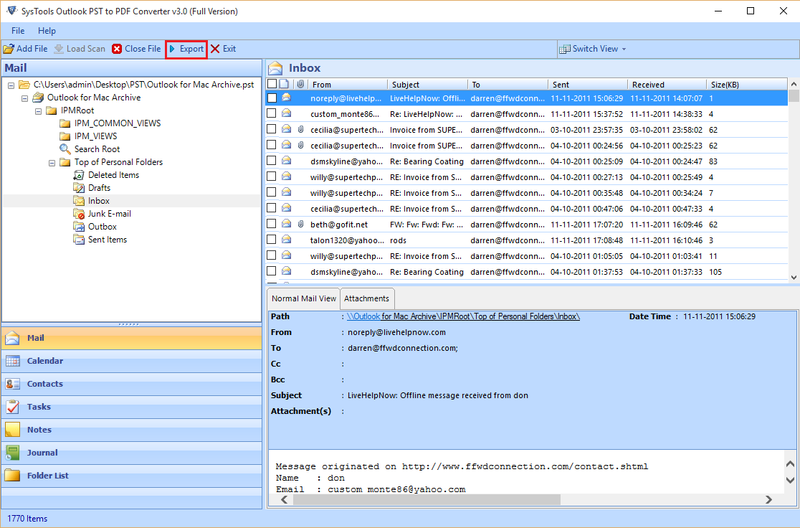 Yes, the tool generates an instant preview of the Outlook mails and attachments and it is easily operable on all the Windows OS. Does the utility compatible with all version Outlook PST file? Yes, The software is compatible with all version of Outlook pst file. It can export pst file which is created by Outlook 2016, 2013, 2010, 2007, and its below. Install the software on your system and the home window of software will appear like this. Click on Add File button to add the PST file to software. Once you click on add file button, the software ask you to choose either File or Folder Mode. Select one according to your need. And click on “...” to brows pst file. Select the .pst file by navigating to its storage location and click on OK.
Now the software show you the complete scanning process You can Stop the process, If you need. View the scanning process details with its status. 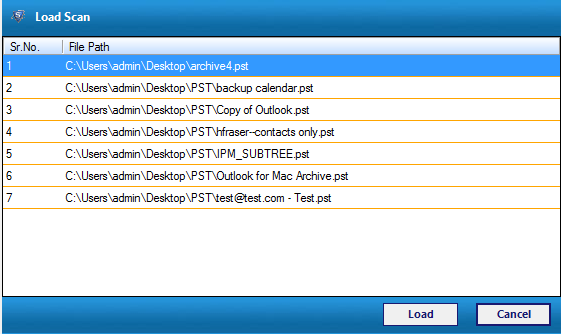 Now entire Pst file will be load in the Folder List section on software window. View Successful scan message and click on Yes. Click on the Load Scan button from software menu bar and load all scanned files. Now load scan window will show you the path. Simply select required one and hit on Load. 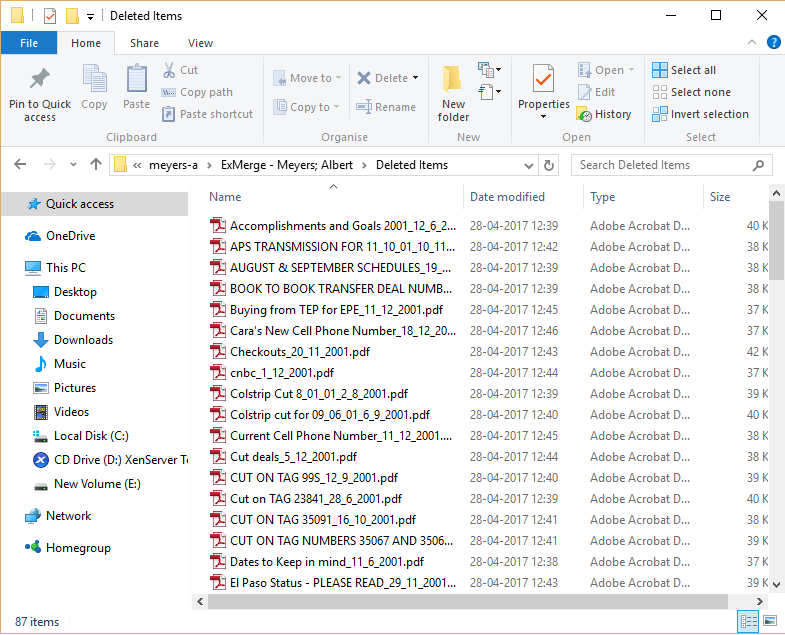 View entire loaded data in the software Folder List panel. Simply click on the Mail tab and all emails in the folder will be displayed. Hit on the Calenders tab to view calender details. Hit on the Contact tab to view calender details. Hit on the Task tab to view calender details. You can select the required emails or complete folder and then hit on Export button. Now an Export Option window will appear. If you want to add some extra feature for conversion then click on Adv. Settings button. Select the Naming Convention to save resultant file. This feature is applicable only for mails. Select Category to apply filters like: Mails, Contacts, Calenders, Task, Journals, Notes. 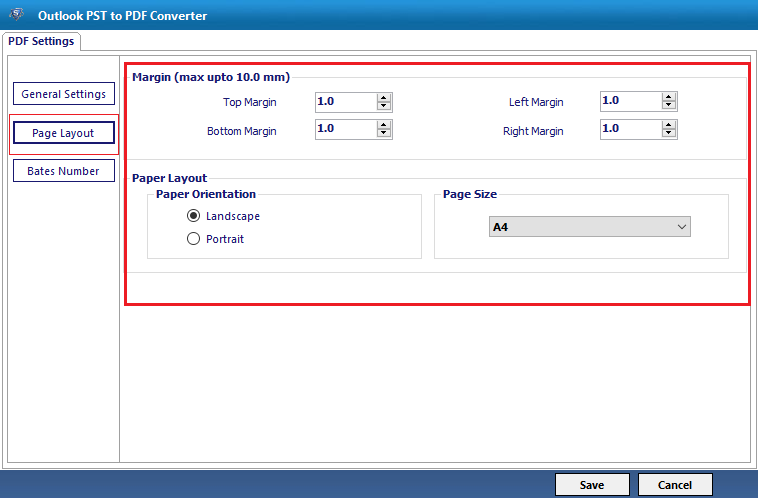 Click on the Page Layout button to select resultant PDF page margin like: top, bottom, right and left. The Paper Layout section will enable you to select Page Size and Paper Orientation. Hit on the Bates Number tab and Select Bates Number Format. 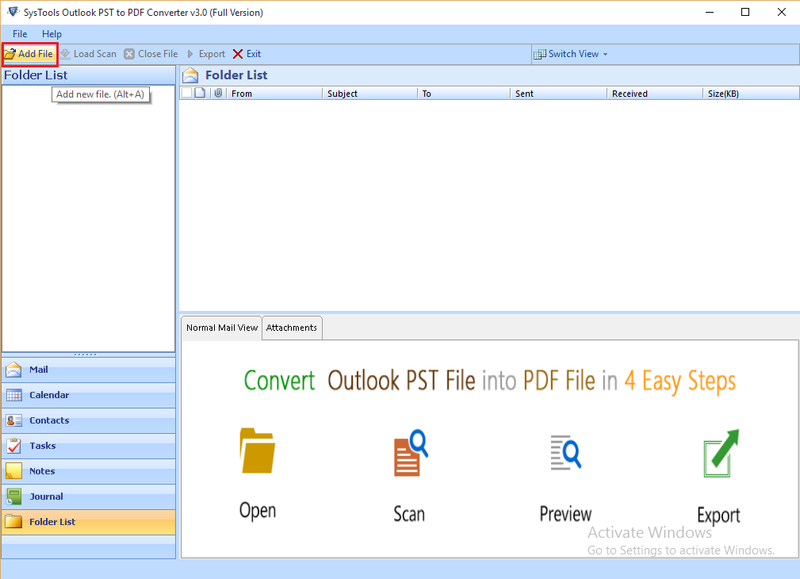 Also Outlook to PDF Converter Tool enable you to add Date Stamp in resultant PDF file. At the end click on Save button. Click on Brows button and select destination to save resultant pdf file. 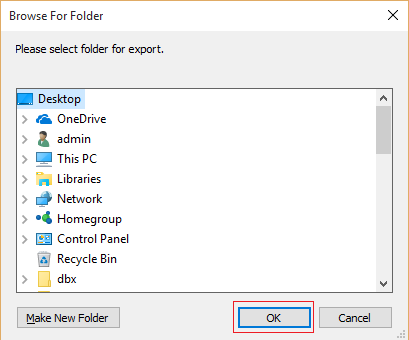 You can select preexisting folder or create New Folder and then click on OK.
Now simply click on Export button from the Export Option window. 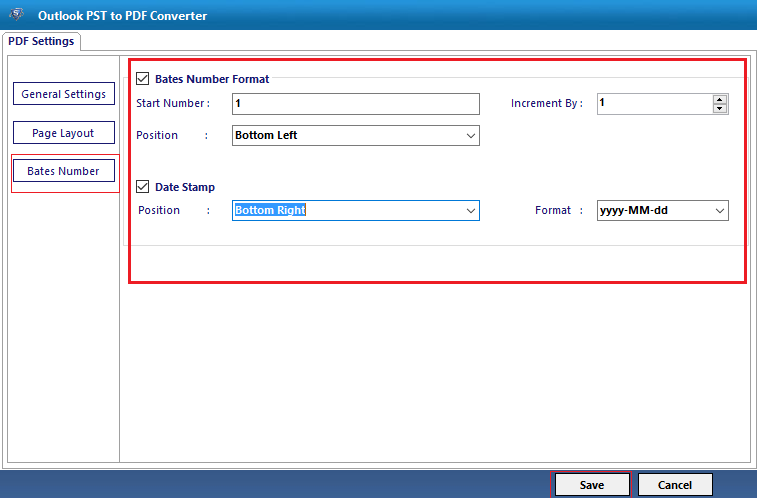 Now the pst file to pdf file converter software will show you complete conversion process details. After successful conversion it will show you confirmation message. 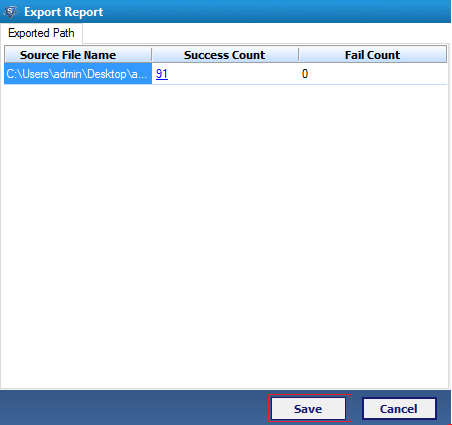 In the next window software will generate complete export process report with the Success Count and Fail Count. Simply click on Save button. Provide location to save .csv file and click on Save. A successful notification will appear with the path location click on OK.
Now navigate to the location where you saved the exported pdf and view entire data. "I haven’t come across such a utility that easily exports Outlook emails, contacts etc to PDF. Using this tool is simply amazing. It is an easy approach to export multiple Outlook files to PDF. Thank you developers! for such an amazing product. You people are just genius." "I just want to appreciate you guys as you all are the creative minds behind the product. 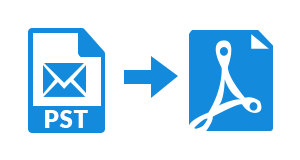 With your commendable work guys, it is really easy to convert Outlook PST emails and attachments to PDF without any hassle. Thank You Developers! Once again a big heartily thanks for your work."